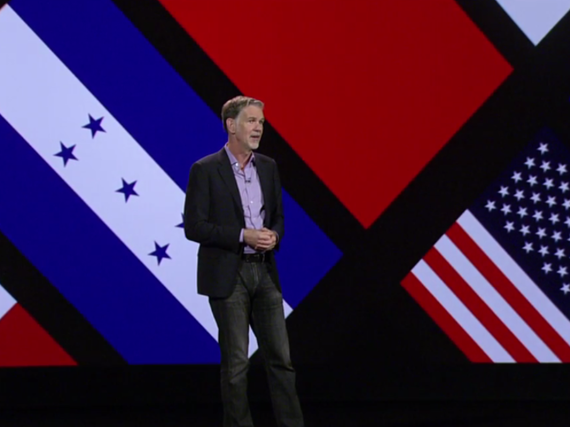 Netflix CEO Reed Hastings said at CES that consumers in 130 countries now have access to its online videoservice and original content. That’s every nation except China. People around the world are flocking to sign up for Netflix’s online video and original content. And the company doesn’t see that demand drying up anytime soon. In the last three months of 2015, Netflix rolled out its service to Japan, Spain, Portugal and Italy. All told, consumers across 130 countries — essentially every nation around the globe except China — can now watch Netflix’s online videos and original content. Those international consumers are definitely signing up. That’s because Netflix’s home market appears to be nearing a saturation point. The company signed up 1.56 million members in the US compared with 1.9 million in the same quarter in 2014. It said it expects 1.75 million US subscribers between now and the end of March, compared to 2.28 million members who signed up in the same three months last year. “Our high penetration in the US seems to be making net additions harder than in the past,” the company said in a statement. New debit and credit cards with built-in chips are still making it hard for Netflix to collect subscription renewals. In October, the company blamed the new cards, with their updated expiration dates, on what it called “involuntary churn.” The new card “rollover continues to be a background issue,” the company said.